You may visit https://www.linkedin.com/in/dansheehan which is my Linkedin profile including Testimonials from real Business Owners & CEOs. Feel free to connect with me on LinkedIn. Here is just what a few are saying about my work! 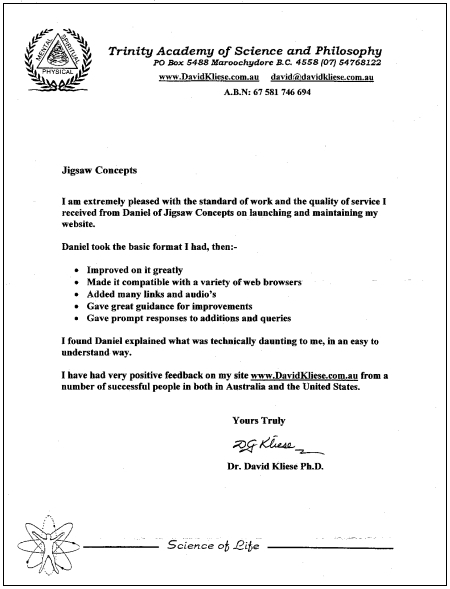 “Jigsaw Concepts has managed these services for us for over 6 years now. Throughout this time we have always experienced outstanding service from Jigsaw. Whether it is a new web project, a minor product update or an emergency fix, Jigsaw always deliver great results and are very responsive. Pacific Communications operates in a fast moving and ever changing industry and as such our ability to keep pace has been very well aided with the tools and services that Jigsaw has provided. 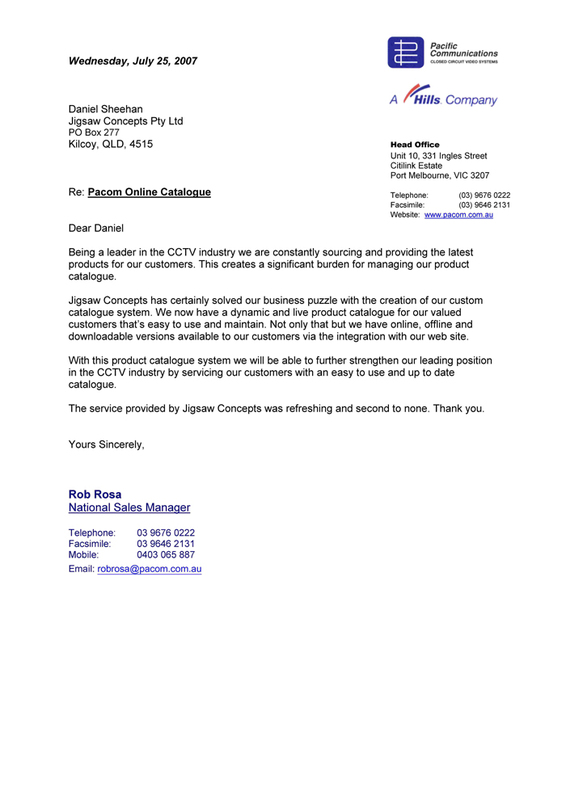 Operating for over 35 years in Australia, Pacific Communications has for many years been regarded as the most innovative and leading provider of CCTV solutions in our region. Jigsaw Concepts created a customized product catalogue system for Pacific Communications which enabled them to have seamless online, offline (paper version) and downloadable versions of their catalogue continually up to date and user-friendly. Jigsaw Concepts provided David Kliese of Trinity Academy of Science and Philosophy with a range of new and improved website services including updating and improving the original website design, client automated newsletter system, downloadable and streaming online audio and converting the website to be compatible with all web browsers. Jigsaw Concepts provided Commercial Security Solutions with a custom built estimating package. The estimating package simplified the quoting process by providing a product selection interface with project analysis (financials) and then integrated the output of the quote into a proposal document ready to send to the potential client. Commercial Security Solutions would like to thank you for your work on the Estimating Package provided by Jigsaw Concepts. Given a brief of what we were looking for, you have provided us with a useful tool that is tailored to our business and needs. Throughout the process you kept us up to date and provided interim versions to “touch and feel”. This provided us with the opportunity to modify and work towards a product we were happy with. We would recommend Jigsaw Concepts to others.